So how is everyone doing with their freelance writing goals for 2010. I know I’ve asked this before but I like to check and see where everyone is, and if you’re still keeping true to your goals and resolutions. I’m so far so good. Definitely building up my own stuff, with some setbacks that have nothing to do with freelance writing. For example, the recent blizzards and having children in the house for days at a time did serve as a distraction. I can’t complain though, the Freelance Writing Jobs network is off to a great start in 2010, I’m off to a great start – and I’m hoping you’re off to a good start as well. Let us know how you’re doing with those goals in the comments. If you haven’t already taken the freelance writing jobs survey, please do so! Deb’s Note: These aren’t jobs. They’re guidelines. Please follow directions carefully. Enjoy your daily lists and freelance writing jobs! Deb’s note: These are submissions guidelines. Not a gig. Please follow instructions. Writers for Hemp Culture Magazine -L.A.
Part Time Blogger – Payment is $100 – $300/month – Find out how many posts are required before agreeing. Happy Chinese New Year and happy belated Valentine’s Day. Welcome to another clean slate Monday where we forget any negativity or missteps of the past week and make a fresh start. What will you do for your positive beginning? As you can see, we did quite a bit of digging out yesterday. It’s been a long couple of days, but it looks like life is returning back to normal. Enjoy your daily lists and have a wonderful weekend. Good morning, Freelance Writing Jobs community. School is canceled for today and possibly tomorrow, thanks to the impending blizzard, so I’m working ahead on Tuesday night. Another reminder of how it’s good to have a backup plan in place for every situation. That isn’t to say I can’t work when my son is at home, just that it’s harder to get as much done. Besides, I may want to go outside and do some sledding or have a snowball fight. Wherever you are I hope you’re warm and dry. Check in and tell us what’s going on in your neck of the woods. Have you taken the Freelance Writing Jobs survey yet? Free Samples & Writing On Spec: Should You? What Fun are Discreet Ilusions? I found a sort of “write for us” page at Content Marketing Pros. Can anyone give me any details about who they are and how they work? Thanks! No time for chit chat. I have a sinking feeling school will be canceled tomorrow and for the rest of the week so I have to plan ahead. Should You Trust Your Freelance Writing Clients with Personal Information? Where is everyone in the Freelance Writing Jobs community located? You don’t have to give specifics, but a general region. My son and I are geography buffs and I’ve been thinking about maptacking the FWJ community as part of project for him. Were you caught in the blizzard this weekend? It wasn’t bad in my neighborhood – maybe six inches of snow – but I know some areas received a couple of feet. Fortunately blogging is terrific for shut ins and social networking helps to keep the cabin fever at bay. 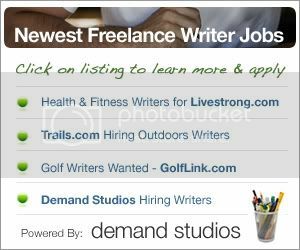 On Friday I mentioned Carson Brackney would be contributing at Freelance Writing Jobs. I’m happy to announce a long time friend of FWJ (and mine) is climbing on board as well. Laura Spencer will also be a regular contributor and will help you land those high paying technical and corporate gigs. We have one more announcement coming up regarding a new team member. I know you’ll help all our new contributors feel welcome. Have you taken the Freelance Writing Jobs network survey? If not, I’d like to encourage you to do so. Taking the survey tells us how you like what we do, what we’re doing right and how we can improve. Local Music Reporters – Ventura County – Negotiable per word rate. Have you taken the FWJ survey to tell us what you think of the Freelance Writing Jobs network? If not, I hope I’m not too forward in asking you to do so. Our periodic surveys are how we learn how we’re doing and if we’re bringing you everything you’re looking for. We received a good response so far and with the exception of one comment (hugs and kisses to my BFF.) we’re receiving positive, constructive criticism. This will help us to bring you the tips and advice you’re looking for, do away with the stuff you’re not feeling and tweak the design so it works to all our benefit. Do take 30 seconds to complete the survey if you haven’t already done so. The link is in today’s list. We’re on a school snow delay on my neck of the wood. If you have some time to kill, you might enjoy a little light reading in your daily lists.